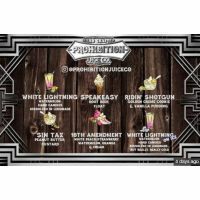 ﻿ AllForYummyVapor - PROHIBITION JUICE CO.
Home » E-JUICES » PROHIBITION JUICE CO.
For years you've been wooed by juice companies with words such as "premium". Not here at Prohibition Juice Co. We allow our flavors to do the talking for us. We're simply here to bring you quality, consistency and the perfect vape. PROHIBITION JUICE 60ML Ridin’ Shotgun(Golden Cookie Pudding)-Golden cookie pudding Sin Tax(Peanut Butter Custard)-Our signature blend of sin..